Animated video leads you through the layers of colour theory. Whether you're struggling with how to paint with complementary colours, or perhaps you want to choose the right colour scheme for a web project or branding design, Manglapus' video A Brief Lesson on Colour Theory will fill you in with some crucial colour terms. 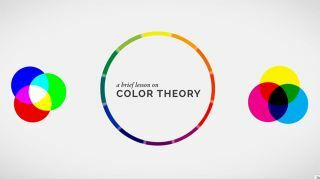 Working up from the basics of colour theory by introducing the colour spectrum, and warm and cool colours, this short video quickly leads viewers through to more advanced terms. Perfect as an introduction or a quick refresher on the key terms, watching this video is a minute-and-a-half well spent. There are plenty of useful colour tools online and offline, which often refer to terms such as analogous and triadic when helping you pick a palette. The animation explains that these terms mean "Groups of colours that are adjacent to each other on the colour wheel," and, "Three colours that are equidistant on the colour wheel", respectively. The colour examples given throughout the animation are clear, enhancing the text explanations. Similarly, the slick, subtle animation style and background music don't detract from the lessons, but keep the video an engaging and even fun educational experience. This is definitely a video refresher to bookmark and share with friends.